Mondays are the days you satisfy the left over cravings from the weekend. The weather has been awful, rain and the biting cold… you know that cold eh? the one down to the bones, that cold down to your hoohaa you just want to jump in bed and do the hot and steamy! So instead of jumping in to bed, make these wonderfully herby chicken burgers from scratch! Some tzatziki spooned over, with some guacamole (of course, can’t have a burger without guac) Perfect Monday! Heat a non stick frying pan, add the olive oil and saute the onion and garlic briefly until they start to soften. Add this to the mince in a bowl with all the other ingredients and mix well to combine. Season with salt and pepper. Roll the mince in to balls, and press down to make a burger patty. To stop the meat from shrinking when cooking, press your thumb in the middle of a patty to make a little dent. Fry the patties in batches, about 2 or 3 in the pan. I like mine a little crispy on the edges, so I left them a little longer. However, it should take about 12minutes. Meanwhile, toast the burger buns under the grill or on a dry frying pan. When the burgers are done, place on a kitchen paper to drain some of the oil, or if you are like me, just sit it on top of the bread and let the bread soak up the oil! NOW! Pile on your tomatoes, onions, and the guacamole… then drizzle on your tzatziki. This is one of those 10-napkins kind of burgers. Don’t try this one if you are trying to be a lady (or gentleman), it just won’t be pretty!! Here’s the recipe for tzatziki… I know, I know, two recipes in one post… ya’ll are just lucky today aren’t you! Grate the cucumber, and drain the excess water. There are several ways to do this; Slice cucumbers, then put in a colander, sprinkle on 1 T salt, and let stand for 30 minutes to draw out water OR just squeeze the grated cucumber by hand over the sink if you are a little pressed for time. Combine all the ingredients in a bowl, season with salt and pepper and refrigerate until needed. I had an excess amount of tzatziki left over, so I made hotdogs the next day and drowned them in tzatziki… Recipe to follow soon! Enjoy the Burger and Keep warm! I made the tzatziki…and guacamole (avocado season yay!!!) and my beef patties. Waaaaa! I’m in love. Burgers two nights in a row. I meant to take photos but my “greed wouldn’t let me…;-). Thanks for sharing the recipe…. I made the tzatziki…and guacamole (avocados are in season yay!!) and my beef patties. Waaa! I’m in love! Burgers two nights in a row!!! Had planned to take photos but my “greed” would not let me….thanks for sharing the recipe. That looks absolutely fantastic. I would not usually do chicken burgers but this I will definately try. Following you on twitter as well. Thank you Catherine… I know what you mean about chicken burgers, but you have to try them! They are just as good as beef or lamb..
Dinner idea pap!!!! 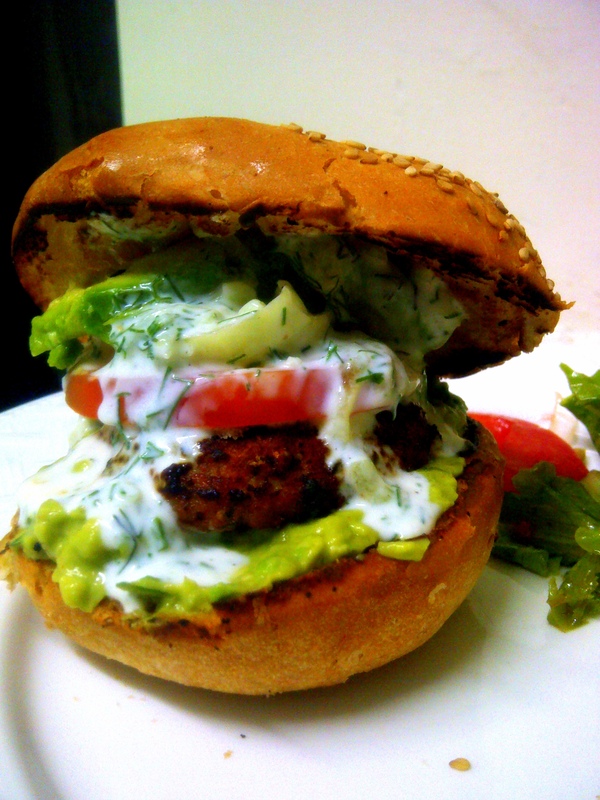 deeper than my kitchens’ tzatziki with my home-made frozen beef burger patties….Eaaazy Peazzy! Home-made beef burger patties… I like the sound of that!